Yesterday the European Commission shared its decision to fine Google €4.34 billion "for illegal practices regarding Android mobile devices to strengthen dominance of Google's search engine". In essence, it claims that Google's practices breached EU antitrust rules put in place to protect customers and prevent unfair stifling of competition. Google has prevented manufacturers wishing to pre-install Google apps from selling even a single smart mobile device running on alternative versions of Android that were not approved by Google (so-called 'Android forks'). Ahead of the ruling on the fine, and deciding on the scale of the fine, Google had already put forward counter-arguments concerning the above three points. 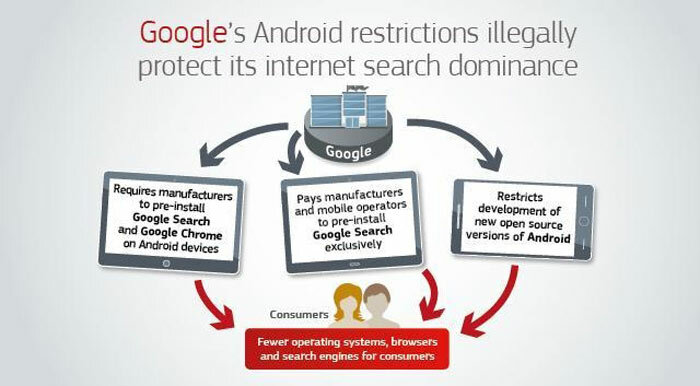 Respectively, Google has claimed; tying of the Google Search app and Chrome browser were necessary to allow Google to monetise its investment in Android, financial incentives for exclusive pre-installation of Google Search across the entire portfolio of Android devices was necessary, and its restrictions on manufacturers wishing to use Android Forks were necessary to prevent fragmentation of the Android ecosystem. Google has previously been in trouble for its business practices in Europe. In 2016 the Commission came to the preliminary conclusion that Google has abused its dominant position in a case concerning AdSense. In 2017 the Commission fined Google €2.42 billion for abusing its dominance as a search engine by giving an illegal advantage to Google's own comparison shopping service. In response to the EC decision Google's Sundar Pichai Tweeted that "Rapid innovation, wide choice, and falling prices are classic hallmarks of robust competition. 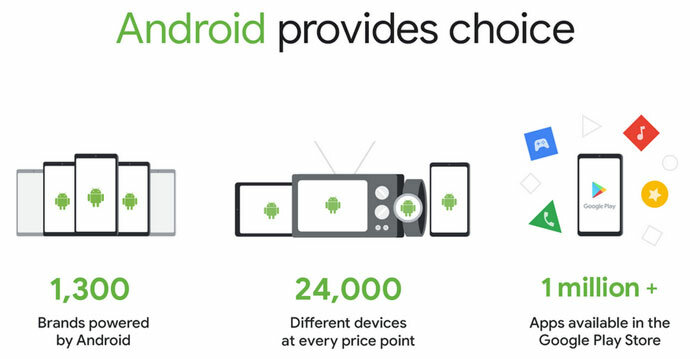 Android has enabled this and created more choice for everyone, not less. This is why we intend to appeal today's Android decision". He followed through with a blog post which builds on the Tweet's argument. Does anyone believe that the benefits of fast innovation, wide choice and falling prices could not have been enjoyed without Android? It sounds like a lot of those benefits come directly from the smartphone component hardware designers and Far East smart device manufacturers. On the topic of the Far East, China, which doesn't play fair with Google as far as including its search and services on phones by default, might be a greater contributor to "rapid innovation, wide choice, and falling prices", depending on how you look at things. However, American corporations bend over backwards to please China - like crashing Apple iPhones that use the Taiwan flag emoji - so they should be more open to the business fairness demands of their allies in Europe. So when do we sue them for listening in on the microphone of every Android device and harvesting advertising potential with it? That has never been proven and if every android phone was listening and siphoning data I think far more than just a couple of grumbly forum people would be in uproar. I think this should be appealed as Google are trying to prevent the cataclysmic breakdown of the Android product by making sure it is kept within a strict boundary. I don't doubt there are aggressive incentives to make sure Google Apps stay on but I also think that's part of their Google Play Store certification for a handset. You get this but this comes with it part and parcel. If they don't want that, don't use Android and make your own custom firmware. However, if this leads to manufacturers being allowed to create their own roms and Google being forced to allow Play store on any of these (literally) homebrew firmwares then I dread the Android of the future. If this does happen I can see users having to navigate a minefield of different versions and forks of android and will contribute further to manufacturers not supporting a phone even quicker because security updates would be harder to integrated across the spectrum. This kind of ruling could set a precedent for Androids future and cripple it if Googles hands get tied. Personally, Android should have been taken out the public space around v4 and then become a solely owned and produced OS under the Google Umbrella only. Forks can be done from the v3 onwards but it should have stayed solely in Googles namespace. Then there are the arguments of “What about Cyanogenmod and OxygenOS and others?”, yeah so what? I've used both and neither perform as well as stock android and some of the features are cool but not enough for me to go “Wow, way to go guys, you made something different”. And I said on another thread from another news outlet, what about Windows Mobile? If it was still around, would they have been sued because they lace and integrate Bing everywhere! The biggest load of horse manure in that, what other major versions are there or are they just wanting to maintain their own in house Sony/Samsung specific version. This just sounds like some whining children didn't get it the exact way they wanted so are tattling on the teacher. I've kind of got multiple views on this. Google brought this on themselves by basically saying if you want the google store, and basically you need the google store, you have to have all our other stuff too, they actually changed their policies a short while ago to make it more in line with what they've been fined for. But instead of mandating and enforcing updates (they're starting to get better with this) as part of the agreement they focused on making sure their ‘data mining’ tools are installed so they can get their advertising revenue. We all know the real reason google made android, it wasn't to be all helpful and make a mobile OS, we had plenty of good ones which could have been developed further, it was about advertising and data gathering which is their core business. Microsoft got fined for doing the same ‘forced bundling’ so it's only fair that anybody else doing it on a ‘major’ platform has the same treatment. The less Google stuff in android the better imo, they can gain a LOT more information from a mobile phone than a pc for most people these days and I'm quite sensitive about my personal data, not Saracen level but I do run protect my personal information. When's Apple going to get a fine… they have a completely walled garden which prevents you from even changing the default browser last time I checked and even if you do it only skins safari. You have no way of installing apps outside of their store without jailbreaking the phone (is that still possible), at least on android you can install apps of your choosing and configure to your preferences. Now if the EU can just get round to forcing them to remove their ‘forced consent’ approach to GDPR to use their platform that would be great…. I could be entirely wrong about this, but I believe it's different because Apple aren't forcing any manufacturers to accept these terms. They install the said software onto their own devices and only their own devices.